This compact scooter is easily dismantled for transportation. 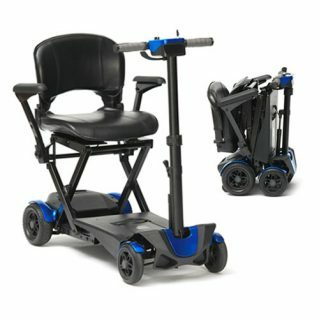 There is a comfortable folding seat with a swivel action to make it easier getting on and off your scooter. It is capable of carrying up to 18 stone in weight, and can go for up to 8 miles between charges. Charging is made more convenient, as the batteries can be charged with the off-board charger, allowing you to leave the scooter in the boot of your car. The heaviest part is a very light 28 lbs, and it offers 2″ of ground clearance.